A challenging hike to reach the three highest summit of the Yorkshire Dales. This region was shaped by glaciers many thousands of years ago, and there are plenty of geological landmarks – striking limestone outcrops and unusual rock formations – to pique our interest as youwalk. 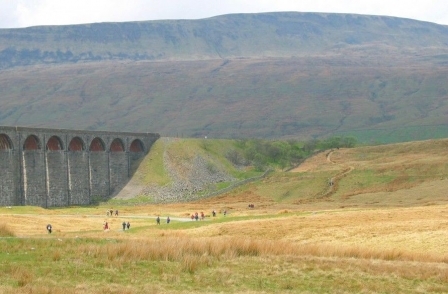 You will also see the famous Ribblehead Viaduct enroute, part of the scenic Settle to Carlisle railway line. This is an extremely tough event over hilly landscapes; at 24 miles it forms an enormous challenge for walkers. Meet late afternoon at Discover Adventure’s campsite near Chapel-le-Dale, nestled between two of the three peaks. After dinner and a thorough trip briefing, prepare your kit and get a good night’s sleep, ready for tomorrow’s strenuous challenge! After a good fuelling breakfast in camp, we set off, walking south through the broad green dale, criss-crossed with dry-stone walls. Ingleborough’s stepped shape – due to its alternating layers of limestone, sandstone and shale – rises before us. Whernside, our second peak, dominates the landscapes behind us. We pass through the village of Chapel-le-Dale and soon reach the base of Ingleborough (723m), where a stepped path zig-zags fairly steadily to the summit of our first peak. We soak up the views over the surrounding dramatic landscapes, an area of rocky outcrops and limestone scars, and the impressive sight of the famous 400m-long Ribblehead Viaduct, built in the 1870s. We then descend along a ridge to the valley below, where we walk parallel to the Settle – Carlisle Railway, enjoying a flattish section! We pass through Ribblehead, at the head of Chapel-le-Dale, and can admire the Viaduct from close quarters. From here we can also see the distinctive whale-back shape of Whernside (736m). We pass numerous limestone escarpments and outcrops; this amazing scenery provides wonderful motivation to keep our legs moving! We gradually begin our ascent, following a slabbed path all the way to the summit. The last section is particularly steep but our efforts are rewarded with the views – on a good day you can see across to Morecambe Bay on the west coast – and the knowledge that it’s not far back to camp! After a short break we come down steeply off the mountain and trek the relatively short and flat distance to camp, where we enjoy a great evening meal in camp with our fellow trekkers. Night camp. A short transfer (15-20 mins) takes us to Horton in Ribblesdale, where we take the Pennine Way towards our third and final peak – the distinctive stepped outcrop of Pen-y-Ghent. As we ascend, we enjoy good views back towards Horton and across to yesterday’s achievements: Whernside and Ingleborough. Clear, well-worn paths lead us quite steeply up to the summit; there are some steep stone steps too. We enjoy time at the summit (694m) to take in the views before taking a westerly path down off the mountain and loop round to Horton once more (exact route may depend on group ability), feeling pretty pleased with ourselves and our accomplishments! After the short transfer back to camp, we say goodbye to the new friends we’ve made and the incredible scenery we conquered, and head home, taking a huge sense of achievement with us. For more information visit Discover Adventure or contact Emma at events@famiy-action.org.uk.